A ‘model’ is a representation of certain elements of a system, selected for experimenters to explore and/or describe specific aspects of the system for a particular purpose. They are not built to represent the complete system. Thus ‘symbolic models’ are constructed from mathematical (symbols) equations, such as a macro-economic model. It can also be diagrammatic, like office layout plans. Multidimensional matrix models can represent the competing demands of customers, shareholders, employees and society at large. The only single total model of leadership is a good leader. By testing and improving models to see if they are both reliable and valid, we can try to build models that work in a wide range of situations, over and above where they were first developed. Models of motivation, for example, tell us that just paying people more money does not necessarily increase performance or motivation, but praise given in front of others and more responsibility generally do in a global context. Modern society increasingly sets paradoxical challenges: think globally and act locally, make a profit while being sustainable, maintain a convincing grand strategy and yet be responsive and agile, nurture innovation while maintaining tradition, encourage diversity as well as a coherent culture. The challenge is to avoid a zero-sum game, where one entity wins and one loses; to reconcile dilemmas through a creative and intellectual dialogue, creating a win-win situation. Theories are developed to understand the world. 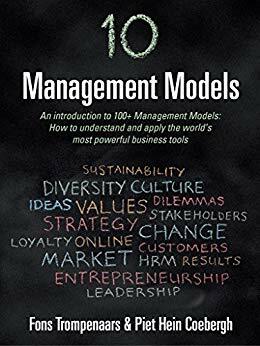 Models are the testable summaries of theories, functioning in social science as instruments to improve organizations. 1. The genius of the Great Entrepreneurs (most prominent 1850–1940): American economic giants. what made them successful seemed almost wholly mysterious and it was hard to explain their brilliant business accomplishments. 2. Measuring results through ‘scientific management’ (most prominent 1900–1930, yet still with us): Frederick Winslow Taylor is often seen as the father of this discipline, although he preferred to describe his approach as ‘managing scientifically’. Different ways of producing goods were measured and compared to one another in ‘time and motion studies’ in order to ‘scientifically’ measure the most efficient production processes. 3. Acknowledging human potential and human relationships (since the 1920s): The conclusion drawn was that the group of women had grown to like and trust each other and the researchers, so that regardless of the variables, it was better human relations that had transformed the situation. Mayo concluded that people don’t behave like machines. Today, management theorists refer to this phenomenon as the Hawthorne effect, named after the location where these studies were first conducted. marking a swing in business management studies from a science perspective to the humanities and arts. 4. Strategic planning envisioned in terms of ‘the art of war’ (prominent 1960–1980): America needed to show its superiority to the Soviet Union and prove that it could ‘deliver the goods’ better than its rival. The notion that economic rivalry was in some respects a military-style engagement grew in popularity. 5. Putting the customer first (since the 1980s): ‘made in Japan’ By the late 1980s, it had become a mark of high quality, not only in the final product, but also in ways of working. Customers would be the first to warn you if things were not up to standard. Six Sigma quality circles became the norm, with defects falling to one in a million. 6. Globalism and diversity (gained prominence from the late 1980s onwards): International organizations like the IMF, the World Bank and the World Trade Organization were safely in American hands, and bailed out nations on condition that they cut back state expenditure on social projects and embrace free-market ideologies. The best leader was an internationalist, part diplomat, part translator, part intermediary, part negotiator. He or she needed cross-cultural competence, thinking globally while acting locally. 7. “Greed is good” (very prominent from the 1980s until 2007): The whole purpose of business was to make money. The bottom line was the ultimate embodiment of all other concerns. Financial performance is an important result, but by no means the only one. Pragmatism is essential. 8. 3Ps: People, Planet, Profit (since the 1970s, but dominating since the twenty-first century): Increasingly, there is demand for a new kind of leadership that can deal with a wide variety of stakeholders, managing the triple bottom line: harmonizing the interests of people, the planet and corporate profit. In order to do this, leaders must innovate – not just new products, but new industrial processes; in new factories, with new machines, new business and production models in which every material/component is utilized in an ever-functional cycle, rather than using up finite resources, in order to be attentive to the needs of all parties. Crisis and failure are not yet eliminated in modern society. Theories or models can give guidance, but they don’t give guarantees. We have a persistent habit of reducing everything to its supposed fundamentals. PROBLEM STATEMENT How can one create wealth by doing business with the 4 billion people at the bottom of the financial pyramid? Be available for the highly dispersed rural market as well as highly dense urban markets; Be fit for rapid evolution. PROBLEM STATEMENT How can I assess the most significant organizational dilemmas resulting from conflicting stakeholder demands and also assess organizational priorities to create sustainable performance? The major dilemmas and how people perceive the organization’s position in relation to these dilemmas; The corporate culture of an organization and their openness to the reconciliation of the major dilemmas; The competence of its leadership to reconcile these dilemmas. After the diagnosis, the organization can move on to reconciling the major dilemmas that lead to sustainable performance. To this end, the authors developed a dilemma reconciliation process. PROBLEM STATEMENT How can reverse innovation create growth? Project organization: Stimulate an entrepreneurial ‘start-up’ spirit; leverage resources through partnerships; resolve critical unknowns quickly and inexpensively. PROBLEM STATEMENT How can we create a long-term plan for sustained competitive advantage by focusing on new markets, without focusing on competition? In blue oceans, organizations invent and capture new demand, and offer customers a leap in value while also streamlining costs. The central idea is to stop competing in overcrowded industries, so-called ‘red oceans’, where companies try to outperform rivals to grab bigger slices of existing demand. Blue Ocean Strategies result in better profits, speedier growth and brand equity that lasts for decades while rivals scramble to catch up. Eliminate factors in your industry that no longer have value; Reduce factors that over-serve customers and increase cost structure for no gain; Raise factors that remove compromises buyers must make; Create factors that add new sources of value. importance of alignment across the value, profit and people propositions, regardless of whether one takes the structuralist (traditional competitive, Porter-like) or the reconstructionist (blue ocean) approach to strategy. make the competition irrelevant by creating a leap in value for both your organization and your customers. The logic behind Blue Ocean Strategy is counter-intuitive, since blue oceans seldom result from technological innovation. Often, the underlying technology already exists and blue ocean creators link it to what buyers value. Most blue oceans are created from within, not beyond, the red oceans of existing industries. Blue Ocean Strategy is an inspiring way to look afresh at familiar environments with a view to finding a competitive edge. PROBLEM STATEMENT How can organizations optimize engagement with their target audience through social media? Strategic – ‘Become a social business’:Social media initiatives gain visibility and real business impact. Converged – ‘Business to social’: Having cross-functional and executive support, social business strategies start to weave into the fabric of an evolving organization. A model to measure current engagement of an organization with its target audience is Li’s Social Technographics Ladder (Li and Bernoff, 2008). The ladder identifies people according to how they use social technologies, classified as creators, critics, collectors, joiners, spectators and inactives. Taken together, these groups make up the ecosystem that forms the groundswell. Each step on the ladder represents a group of consumers more involved in the groundswell than the previous steps. To join the group on a step, a consumer need only participate in one of the listed activities. Steven van Belleghem, from Vlerick Business School, has developed a three-step approach to setting up and managing a conversation on any level of the Technographics Ladder: observe the conversation you perceive as relevant as an organization, facilitate the conversation you want to create and join the conversation as a peer. The authors of Groundswell suggest the POST approach for change, working with people (assess social activities of customers), objectives (decide what you want to accomplish), strategy (plan for how relationships with customers will change) and technology (decide which social technologies to use). PROBLEM STATEMENT How can one measure the return on investment (ROI) of social media? Applying the model may result in developing an overall dashboard for the organization to monitor progress of a company’s conversation strategy, or it can be used to help define which metrics need further refinement and how they connect with other metrics (as, for instance, used in a balanced scorecard) that measure success in corporate communications. PROBLEM STATEMENT How should an organization communicate during a crisis? Intentional: Where the organization knowingly took inappropriate risk – major reputational threat. identifying a limited set of primary crisis response strategies: Denial (attacking the accuser, denial of the story, scapegoating); Diminishment (offering excuses, justification of what happened); Rebuilding (compensation of victims, offering apologies, taking full responsibility). PROBLEM STATEMENT How can employee engagement be strengthened through communication? PROBLEM STATEMENT What is the optimum level of transparency for an organization? When there is little transparency in a given environment, people find it difficult to trust each other and hesitate to behave flexibly. Conversely, redundant transparency results in people feeling over-monitored, making them feel mistrusted. PROBLEM STATEMENT How do we turn poverty into development and scarcity into abundance with what we have? More information can be found at www.zeri.org The ZERI movement is engaged in a wide range of projects that are recorded and shared online through www.theblueeconomy.org.